Australias’ re-elected Prime Minister Malcolm Turnbull has scraped victory with a tiny majority that will make delivery on the health of the Reef more difficult. Turnbull will need support from independent MP’s, having rejected a deal with the Australian Green Party. « Every single commentator from David Attenborough down has attributed coral bleaching to global warming, and Australia has done absolutely nothing about its CO2 obligations. » The Kennedy coastline is some of the hardest hit in the latest wave of coral bleaching. The Great Barrier Reef took centre stage early in the election campaign when research showed that 93% of the Reef is dead or dying from bleaching. Coral bleaching happens when increasing ocean temperatures from global warming forces corals to eject zooxanthellae[i] algae. Corals need the algae to help photosynthesize and reproduce. Without photosynthesizing the corals turn white, and eventually die. Scientists liken the phenomenon to ten cyclones slamming one after another and another into the corals. Aerial and underwater surveys found that 81% of the northern section is severely bleached with just one percent still intact. The central section fairs a little better, with 33% of the corals severely bleached, and 10 percent escaping. Marine scientists claimed that without drastic action on climate change, there will be more intensive waves of bleaching along the length of the Reef. Eliminating Risk by Removing the Facts. 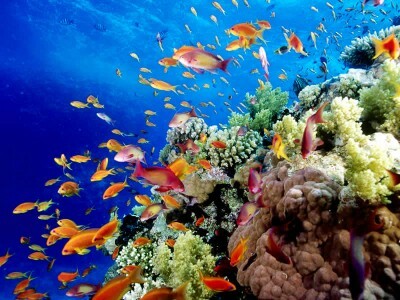 Four weeks into the campaign and the Australian Department of Environment was caught removing all references to the Reef from a joint UNESCO (United Nations Educational, Scientific and Cultural Organisation), United Nations Environmental Program (UNEP), and Union of Concerned Scientists report on climate change and World Heritage sites. The Australian Department of Environment, which having seen an earlier version with an entire chapter dedicated to the Reef, requested a redaction of any reference to Australia’s three World Heritage sites, Kakadu National Park, Tasmanian forests and the Great Barrier Reef. The department’s justification was this was solely a preventative measure against causing panic and confusion, which could adversely affect tourism. Reasoning that the orginal report title, Destinations at Risk: World Heritage and Tourism in a Changing Climate would be misleading, and with the Reef being taken off the ‘at risk’ list the year before, the word ‘risk’ the department argued could confuse people as to the status of the Great Barrier Reef. Australian Greens Party Deputy Leader and Queensland Senator, Larissa Waters warns « The Government will stop at nothing to cover up the devastating impact its inaction on global warming is having on our World Heritage Areas like the Great Barrier Reef and our magnificent Tassie Wilderness ». Damage limitation saw the two main parties (Liberal National and Labor) pledging billions of dollars to save the Reef. Prime Minister Turnbull promised $5bn over ten years to improve water quality from agricultural run-off. Yet, the Great Barrier Reef is worth $5bn a year to the Australian economy. And a 10 percent investment for activists and others who care, is little more than a rebranding exercise. GetUp! Action for Australia’s Campaign Director Sam Regester says the money is simply being redirected from investment in renewables claiming « We’re highly dubious of the government’s decision to rebrand money already earmarked for renewable energy to farmers to make irrigation more efficient ». He adds, »the government is still handing out $7 billion in taxpayer’s cash to pay for the coal and gas industry’s fuel. And they’re still cutting over a billion in renewable investment from the Australian Renewable Energy Agency ». A seemingly unwillingness to invest in renewables contrasts with a continued push to expanding coal and mineral exports. Boom Or Bust: A Nations Love Affair with Coal. The Great Barrier Reef sits off the coast of Queensland. Covering two thirds of the States’ coast. It stretches from Cape York at the tip of Australia down past the pristine white sands of the Whitsundays and into the sub-tropical southern half of the state. Sitting astride the tropic of Capricorn is a proposed mega-mine the Gaillee Basin project. End-to-end the basin measures almost 200 miles (300 km); covers an area (247,000 km2) larger that the UK (243,610 km2) and holds over 25 billion tonnes of coal. Incorporating the Adani and Carmichael mines, coal will be shipped out of nearby Abbott Point Port and through the Great Barrier Reef. The Australian Climate Council estimates the mega-mine will emit an « estimated 705 million tonnes of carbon dioxide each year – more than 1.3 times Australia’s current annual emission ». Australia’s PM has bipartisan support and with all but the Greens Party objecting, means the mega-mines will go ahead. Australia will be relying on independent MP’s for checks and balances if the government is to seriously address climate change and the nations relationship with the mining industry and renewables if they want the Great Barrier Reef to survive. Maxine Newlands is a Political Scientist at James Cook University, Queensland, Australia. Her research centres on environmental governance, politics, protest movements and political communication in the media. Maxine is a regular political commentator for both print, TV and radio, and has been writing for the Ecologist since 2012.